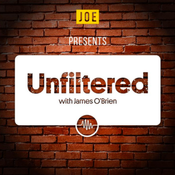 After 50 fantastic episodes, James O’Brien’s time at the helm of Unfiltered is sadly coming to an end. In this special episode with BBC Radio 4 presenter Fi Glover, James signs off from the interviewees chair with a touching conversation about his life. James shares his experiences from growing up adopted and getting expelled from school to breaking into journalism through gossip columns and showbiz, before ultimately finding his ideal platforms at LBC and JOE. He talks about the curse of being right when all is going wrong, his personal politics, views on free speech, the dangers of amplifying extremists, that infamous Nigel Farage interview, and offers his thoughts on private education, capitalism and economics, feminism, sexual abuse, #MeToo, the future awaiting Britain, and of course, Brexit. Unfiltered will return with a new presenter after a very brief hiatus. You probably know Gina Miller as the woman who took the government to court for attempting to implement Brexit without a vote in Parliament, but there’s much more to Gina Miller than the headlines. In this fascinating interview with James O’Brien, Gina shares her story, moving from Guyana to the UK, becoming a successful businesswoman, her campaigns and crusades for transparency and fairness, culminating in the Brexit legal challenge and the fallout that followed. Legendary film director Spike Lee joins guest host David Lammy for a fascinating interview about his extraordinary career, his latest effort BlacKkKlansman, reflecting on the presidency of Barack Obama, and a little North London rivalry between Spike’s Arsenal and David’s beloved Tottenham Hotspur. Normal service will resume next week when James O’Brien returns from holiday.